The last decade has seen an increase in vinyl sales as consumers look to connect with music through a tangible experience. This show focuses mainly on music that has been reissued and or compiled on vinyl by independent labels who are some of the main actors responsible for digging up and putting out 'lost classics'. Each episode will play a mix of records from different labels and use vinyl reissues as a medium to explore different countries, regions and styles of music. The sea of information that is the internet can be overwhelming, let Spinning Hourglass be your guide! 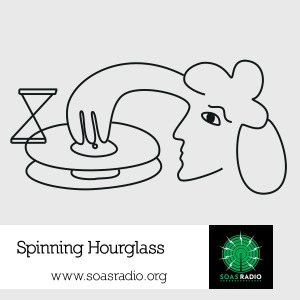 Spinning Hourglass returns after a short hiatus. Originally aired live 29/11/2017 12-1pm. Maestro and recurring guest Marcus Engwall returns for a third and perhaps final guest appearance joining Untuk DJ on air during SOAS Radio's Wednesday Live broadcast. Originally aired 18/10/17 5-6pm. Untuk DJ returns before the Autumn equinox hits the northern hemisphere to bring you his favourite summer jams! A mix of records originally released in Brazil and Sweden! Expect Bossa Nova classics, Brazilian Funk and Swedish artists and bands influenced by Latin, African and Brazilian music! Untuk DJ runs through some of his favourite tunes from London based producers, bands and labels! Noah Priddle returns to Spinning Hourglass to showcase some of the bands and producers that will be playing at the Mondomix Festival on the Isle of Wight! Ben Tier from Shakara Soul joins Untuk DJ for a guestmix and chat! Tune in for some selections of funk, soul and jazz! Untuk DJ invited Wah Wah 45s main man and international DJ extraordinaire Dom Servini over to play some tunes and chat. Tune in for on air antics and some new and old tunes! Spinning Hourglass gets in the mood for spring with a selection of reissues, new and old! Originally broadcast 22.03.17. This episode of Spinning Hourglass brings you two guest mixes with music from or inspired by the Arabic speaking world. Tune in as Moth from White Noise joins Untuk DJ for a quick chat about the budding electronic music scenes in the Middle East and North Africa. Untuk DJ plays a selection of tracks from reissues and compilations to clear his ears in the wake of Valentines day! Originally broadcast between 5-6 PM 15/02/17. This weeks Spinning Hourglass is a guest mix from Calle Wahlström recorded in Stockholm! A mix of tracks from reissues and compilations to accompany the sunset. Originally aired on SOAS Radio, 1600-1700 GMT 30/11/16 . The second episode of Spinning Hourglass brings a Marcus Engwall to the studio for a quick chat and a mix of tracks that he has been waking up to and having his morning dancing session to. The pilot episode of Spinning Hourglass gives a selection of tracks from labels that specialise in reissues and compilations.